Charlotte Martin :: View topic - Crazies.... Your second video chat with Charlotte! Crazies.... Your second video chat with Charlotte! Posted: Thu Sep 15, 2011 2:08 pm Post subject: Crazies.... Your second video chat with Charlotte! 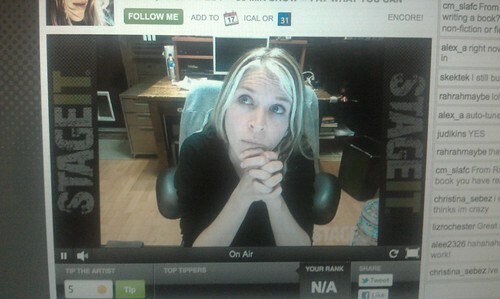 Be sure to check your email for details about the next video chat with Char. the last one was a great great time. so fun. so wonderful to "see" char mar and interact with her. i love char mar. i love the internetz. i love SLAFC!! But am I the only one wondering...if we signed up and have an account for the last chat - I'm assuming we don't have to email again...right? Do they still have all that info? Hmmm..probably and I am just being silly. i'd send in your info just in case. i dunno? probably to have a sense of who's coming? Posted: Tue Sep 20, 2011 8:26 pm Post subject: . In order for us to reserve room in the chat, information must be submitted to us once again, but you may use the same StageIt username as the first chat. Also if you want to ask Charlotte a question, which is kind of the whole point, you'll need to e-mail "again." Posted: Wed Sep 21, 2011 8:36 pm Post subject: . Posted: Thu Sep 22, 2011 7:01 pm Post subject: . If you registered for the chat, please expect details in your inbox on Friday morning! Posted: Fri Sep 23, 2011 9:22 am Post subject: ! Never fear, we have not forgotten to send chat details for tonight - working out a few kinks. Coming soon! If you have not received the password by now, please email us! yeah, never got the password. Awesome chat! 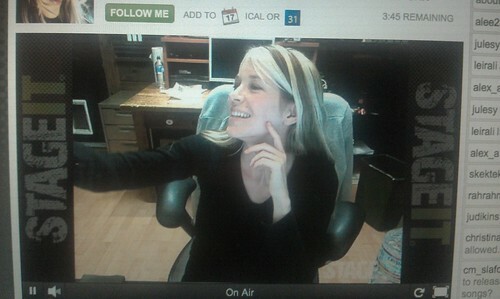 Thanks to Jules, Lisa and of course Char, Mom Char and Ken for the chat! 30 minutes isn't a long time, but it's something I wouldn't give up! Posted: Fri Sep 23, 2011 9:21 pm Post subject: ! that was SO MUCH FUN!!! 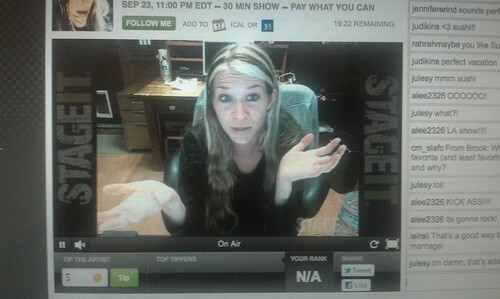 thank you char, lisa, stageit and fans!!! seriously so much fun. so great to 'see' char mar! Okay, Your pics are totally better than mine, Jules. - Poor Pinot Noir had a tooth pulled, which is good for him in the long run (something about they always thought he had bad breath due to licking his own bum, but it was really a bum tooth). More than anything, I am pleased as punch that she is in good spirits physically and mentally. She was bouncy, goofy, and silly- read: Old Char is back, baby! She also leaked some other things, but I'll leave it to Jules and Lisa to inform the masses on those. The video chats look so much fun! I'm jealous of you crazies! Thanks for posting the screencaps and sharing news from the chat. The v-chat really rocked! It got quite strange at times too!